American pastor Andrew Brunson is being held in Turkey on accusations of terror and espionage.In a tweet, President Trump called Brunson "a great Christian, family man and wonderful human being." The Trump administration is threatening sanctions against Turkey if the U.S. ally does not release an American pastor being held there on accusations of terror and espionage. At a State Department event on religious freedom Thursday, Vice President Mike Pence called for Brunson's immediate release. "If Turkey does not take immediate action to free this innocent man of faith and send him home to America, the United States will impose significant sanctions on Turkey until Pastor Andrew Brunson is free," Pence said. In a tweet, President Trump echoed that threat, calling Brunson "a great Christian, family man and wonderful human being." Brunson, 50, is originally from North Carolina and has lived in Turkey for more than two decades. He was swept up by Turkish authorities along with journalists, activists, military officers and others in a government crackdown following a failed military coup attempt in 2016. Speaking at the State Department's Ministerial to Advance Religious Freedom – a new event under the Trump administration – Pence was joined by Brunson's daughter, Jacqueline Furnari. He promised her that he and Trump would continue to fight for Brunson's release. The vice president said he'd also recently spoken to Brunson and his wife. "I know that his faith will sustain him," Pence said. "But it shouldn't have to." Brunson was held for more than a year without charges before being accused of "dividing and separating Turkey by simply spreading his Christian faith," Pence said. The pastor has denied being involved in anti-government activities, as Turkish authorities alleged. In April, a bipartisan group of senators led by Thom Tillis of North Carolina signed a letter expressing concern about Brunson's situation and describing the accusations as "flights of fantasy, and random character assassination." 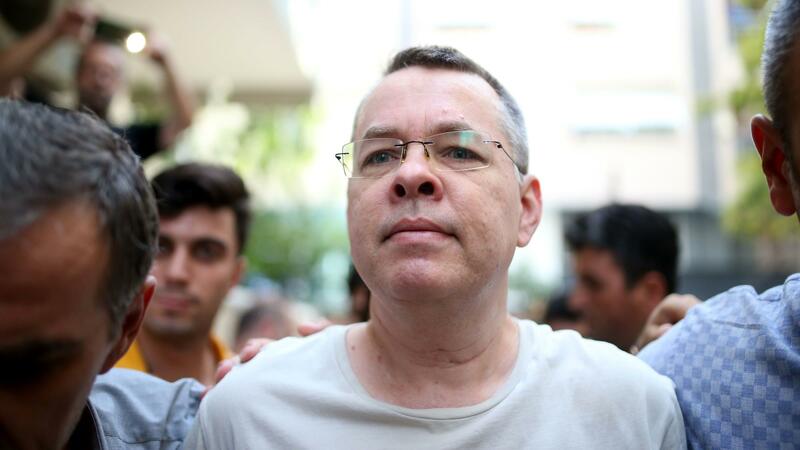 This week, the Senate Foreign Relations Committee approved legislation that would impose financial penalties on Turkey until the government ends the detention of Brunson and other U.S. citizens. "We never wanted this bill to be necessary, but we warned the Turkish government that there would be consequences if it did not cease its unjust detention and harassment of U.S. citizens and locally employed embassy staff," Chairman Bob Corker, R-Tenn., said in a statement. Brunson was released from prison on Wednesday and placed on house arrest, and forbidden to leave Turkey. Pence called that move a "welcome first step" but "not good enough," and called on "believers" to pray for Brunson's release. The White House has not provided details on the proposed sanctions against Turkey, nor announced a firm deadline for Brunson's release. Pence said only that Turkish President Recep Tayyip Erdogan should be "prepared to face the consequences" if the pastor is not released immediately. The news is being praised by leading evangelical Christians, who form a key part of Trump's base and have long advocated for increased protections on religious freedom in the U.S. and abroad. Johnnie Moore, one of Trump's informal evangelical advisors, tweeted, "Bravo" regarding Pence's remarks. "The threat of sanctioning Turkey sends a clear message to that nation — and every nation in the world — that when it comes to religious freedom, the United States means business," Moore told NPR in a statement to NPR. Moore said a coalition of influential Christian pastors and advocacy groups are preparing to urge their congregations and other networks to boycott Turkish tourism, including Turkish Airlines, in an effort to put pressure on Turkey to release Brunson. He said the coalition wants to highlight the pastor's plight "while there's momentum" around the issue. The message, Moore said, is, "If Turkey isn't safe for Brunson, it isn't safe for us." Tony Perkins, another Trump ally and advisor, called the move a "clear, unequivocal message to the tyrants in Turkey" in a tweet. Brunson is being represented by the American Center for Law and Justice, which released a statement crediting Trump's "critical role" in Brunson's release from prison this week. The group's chief counsel, Jay Sekulow, has also represented Trump in legal matters.